Sydney Petersen and Nolan Patin “accidentally” ended up in each others’ costumes and added much laughter to the performance. 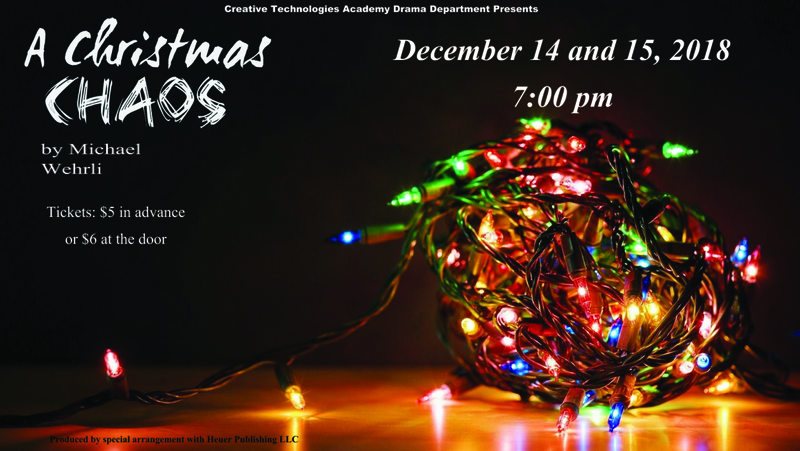 On Friday, December 14 and Saturday, December 15 the CTA Drama department presented their third annual fall play. This unique twist on Charles Dickens famous story follows a group of actors who are forced to put on A Christmas Carol after the Royal Shakespeare Company gets lost. The local actors scramble to do their best to bring the story to life, but end up with two Tiny Tims, a narcissistic Scrooge, ghosts in bed sheets, an actor who plays both Bob and Mrs. Cratchit at the same time and much more! 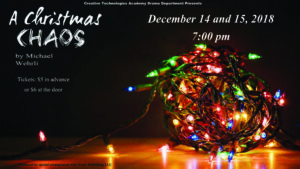 The CTA drama department continues to build and expand the program with bigger shows. This show was performed by 22 students in grades 9-12. Because of the unique script writing, students not only got to play classic Christmas carol characters but also got to play themselves trying to put on the show. It was a show within a show! Overall, the play brought some big laughs yet still told the story of “A Christmas Carol”. 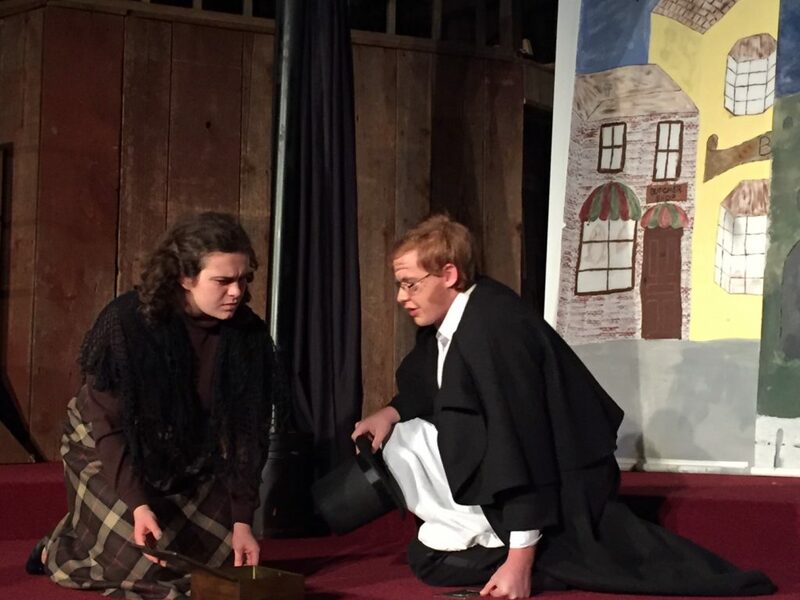 Elizabeth Jahns and James Hazen played out the scene between the beggar and Ebenezer Scrooge. The girls and boys basketball programs are off to a great start. This year, the boys program added a middle school team that has kicked off the season and currently with a 2-3 win-loss and are led by captains Avery Bishop and Landon Winters. The boys varsity team is off to a strong start at 4-1 and are led by captains Charles Wortz and Luke Hubbard. Both teams are coached by Todd Bowmar. The girls varsity team is 2-2 on the year so far and are led by captains Brin Calkins, Hannah Hofstra, and Faith Watson and are coached by Lisa Perry. CTA is now a part of the Great Lakes 6 league and both teams are looking like strong contenders. Be sure to come on out to support them and watch them in action at any of their home and away games! K-5 students all performed together for two of the songs in the concert. On Monday, December 3, the Elementary students performed in a music concert themed around the book “The Polar Express” by Chris Van Allsburg. The students dressed in their pajamas just like the kids in the story. Several 3rd, 4th and 5th graders read the story of the Polar Express at the concert. In between the readings, all the students sang different songs that helped to tell the story. The students learned American Sign Language to go along with two of the songs: Believe and When Christmas Comes to Town. These two songs also featured soloists during the verses. The concert was directed by Bethany Holtrop and Jeremy Holtrop accompanied two songs on the piano. The Charger Voices were conducted by Mr. Jeremy Holtrop. On Monday, December 17, the CTA middle school and high school choirs performed their annual holiday concert. This concert featured three different choirs. 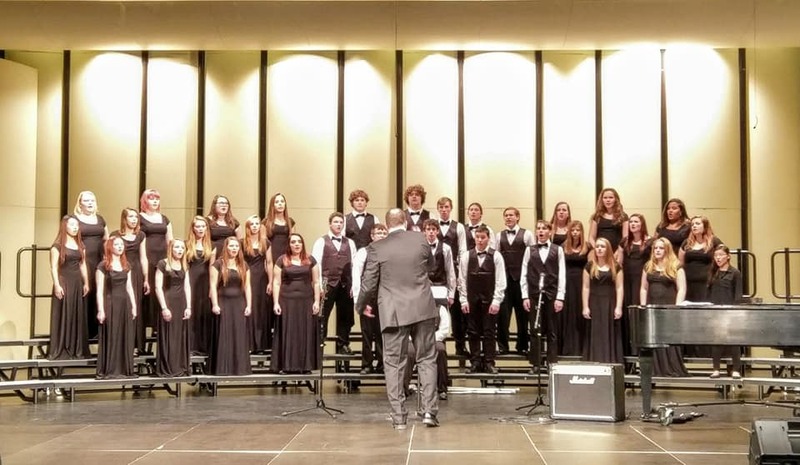 Our middle school choir, Harmonic Chargers; our high school choir, Charger Voices, and our recently formed a cappella choir, Voices of Lightning. Each group performed 4-6 pieces and then all singers performed together to close the concert on “Christmas Canon Rock” which featured CTA student, James Mauric on electric guitar. James rocked it out mimicking the Trans-Siberian Orchestra. Also, CTA alumni choir students came back and performed “Carol of the Bells” as part of a yearly tradition. for donations to be dropped off. This year Creative Technologies Academy once again participated in the Toys for Tots toy drive. Over the past two weeks, students and their families have brought in a total of 109 toys. 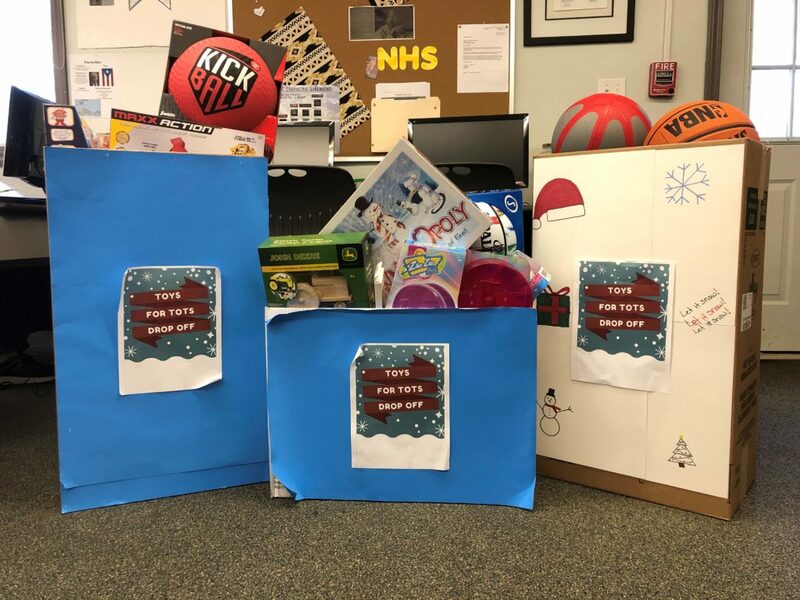 In addition to that, the CTA staff usually pool funds to purchase gifts for the administrators and chose this year to do a donation to Toys for Tots on behalf of the administrators. The staff raised $225 for more gifts. “…it was such a blessing to shop and donate these additional gifts so that children can have a toy under the tree on Christmas day,” shared elementary principal Autumn Mattson. It’s part of the CTA way to believe that it is better to give than to receive. Girls Assistant Basketball Coach: Seeking a Girls Assistant Basketball Coach with employment to begin immediately upon hire. Assistant Basketball Coach with employment to begin immediately upon hire. Position available for a Girls Soccer Coach with employment to begin in the Spring of 2019. Specific questions for any of the listed position and a complete job description can be obtained by emailing dgeorge@ctachargers.org. Beacon Light performed for the community and took time to autograph after the concert. CTA had the privilege of welcoming Hip Hop artist Beacon Light on Tuesday, October 30! Beacon’s songs have been featured on Spotify playlists, iTunes Top Billboard charts, television shows, and films. 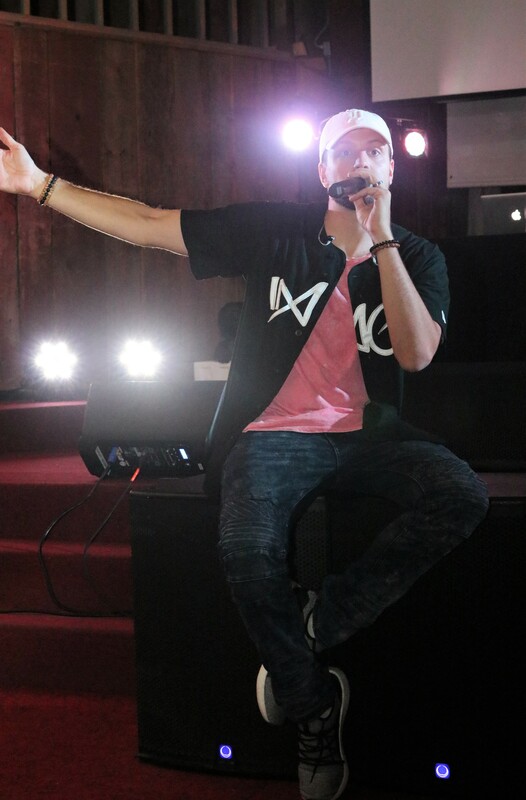 His video “Haters” won Video of the Year in the 2016 We Love Christian Music Awards . Beacon shared at a student assembly during the day and offered a free community concert in the evening. Beacon’s performances included both his music and his story, which offers encouragement and hope to the audience.